An atmospheric river will bring periods of moderate to heavy rain to the region from Monday through Tuesday night. 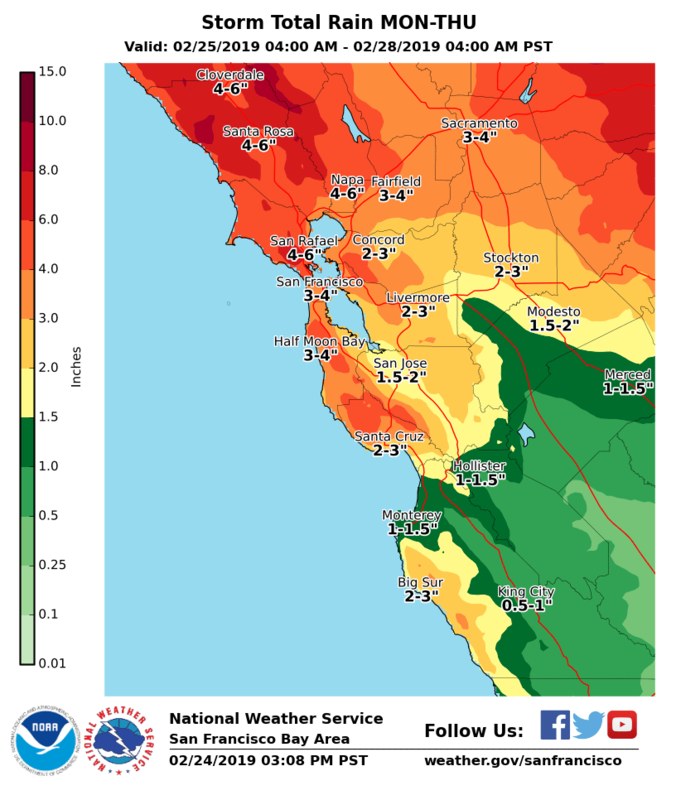 Heaviest rainfall is expected across the North Bay where flooding potential is highest. Heavy rainfall is also possible for the Central and Southern Bay Area and Santa Cruz County. In addition, strong and gusty winds are forecast to occur from Monday through Tuesday night with the strongest winds expected late Tuesday and Tuesday night. The Flash Flood Watch continues for a portion of western California...including the East Bay Hills and the Diablo Range...East Bay Interior Valleys...Northern Monterey Bay...San Francisco...San Francisco Bay Shoreline...San Francisco Peninsula Coast...Santa Clara Valley Including San Jose and Santa Cruz Mountains. 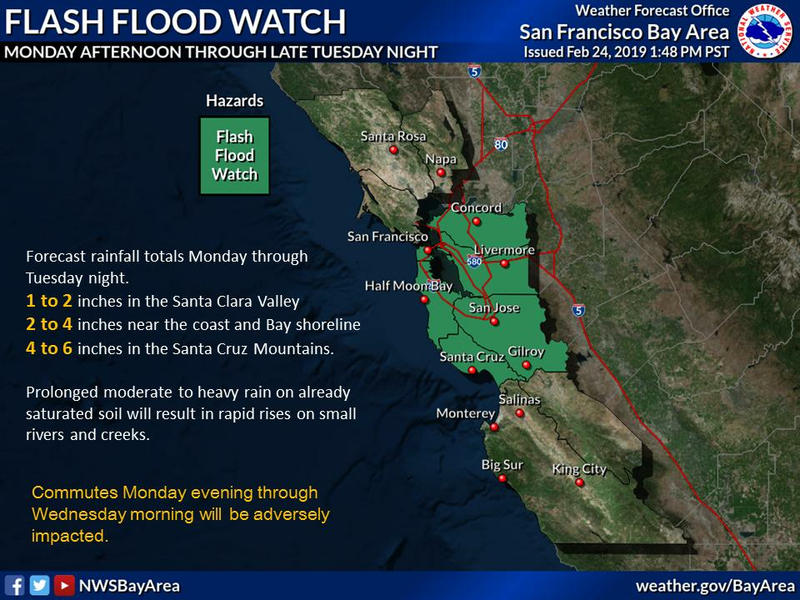 Moderate to heavy rain is forecast to spread south across the San Francisco Bay and adjacent areas Monday afternoon, reaching the Santa Cruz Mountains by Monday evening. Periods of moderate to heavy rain will continue through late Tuesday night. 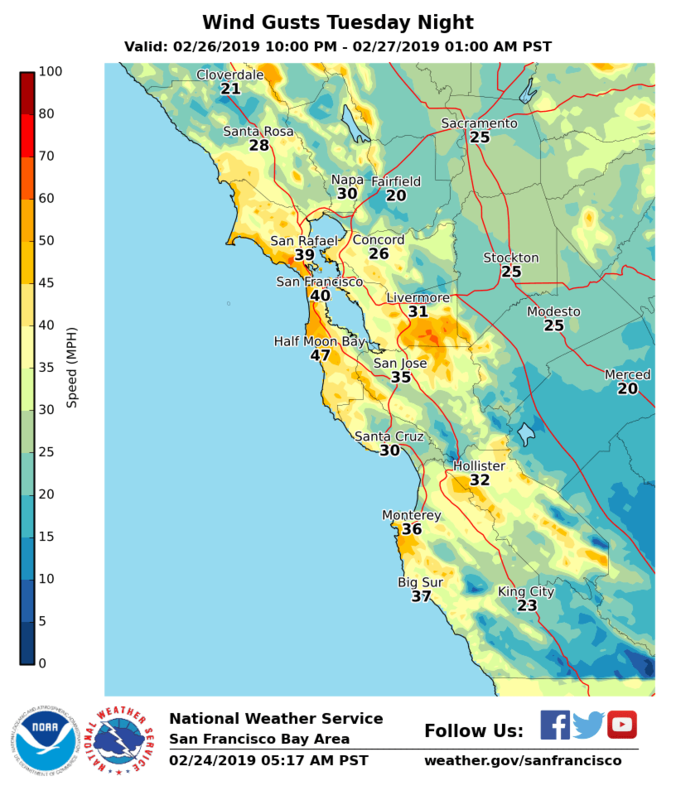 Forecast rainfall totals during this period of time range from 1 to 2 inches in the Santa Clara Valley, 2 to 5 inches near the coast and Bay shoreline, and 6 to 10 inches in the Santa Cruz Mountains. Prolonged moderate to heavy rain on already saturated soil will result in rapid rises on small rivers and creeks. Flash flooding is possible from late Monday through Tuesday night. Urban flooding in low lying areas is likely. Widespread shallow landslides, rock slides, and debris flows are likely in steep terrain. Commutes Monday evening through Wednesday morning will be adversely impacted.